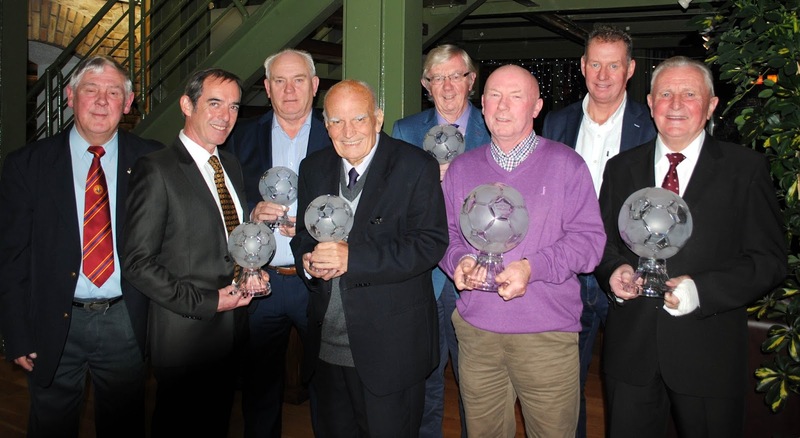 All the recipients at the soccer awards held in the Kiln Room in Murphy’s Brewery on Friday night (25 November 2016). Also in the picture is Ted O’Mahony (Cork AUL Chairman and Jim Cashman (Murphy’s Irish Stout). 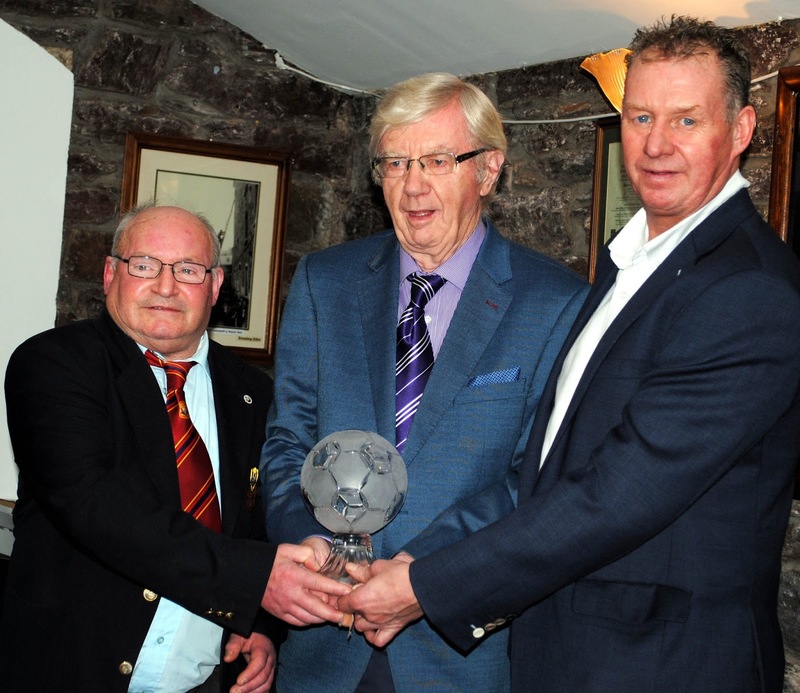 Ted O’Mahony (Chairman Cork AUL) presents the Soccer Legend Award to Michael “Blondie” Aherne at the Cork Soccer Honours Awards held in The Kiln on Friday night. Also in picture is Jim Cashman (Murphy’s Irish Stout). In May 1951 English League side Luton Town travelled to the Mardyke for a beneﬁt match when “early birds” to the venue enjoyed the curtain raiser, an U14 League tie between Ringmahon Rangers, who were making their ﬁrst ever appearance on a football pitch, and Western Rovers. Some very famous sports stars, including future rugby Internationals Tom Kiernan and Jerry Walsh, lined out with Western who took the points thanks to a lone goal from Don Durston who played for Ilford in the FA Amateur Cup ﬁnal at Wembley in 1968. Among the Ringmahon debutants was an eleven year old kid who eight years later would become synonymous with the venue and with Cork Hibernians. In the meantime he helped create, not one but two records in underage football which could never be bettered. The ﬁrst record was being a member of a Ringmahon team which won the U16 League Championship with maximum points and without conceding a goal. Of course, the International selectors had to take note of that great achievement and two of their stars were capped. Goalkeeper Bobby Brohan had to be recognised and the other cap was awarded to Michael “Blondie” Aherne, the hottest talent on Leeside. Blondie wasn’t the most popular player down in the ﬁshing village when the following season he transferred to deadly rivals Glasheen. With Glasheen he helped set another astonishing record 7 a clean sweep of every trophy available to Youth teams in the country including, of course, the FAI Minor Cup. Their record in that memorable 1957 season was played 38, won 38, scored 154 goals and conceded just 15. Blondie made his debut for Cork Hibs versus Transport during the 1959-60 season and in a career spanning seven seasons he played 208 times and scored 19 goals. Up the ‘Dyke he partnered some of the legendary cross channel signings such as Charlie Tully and Tommy Eglinton and provided the assists for lethal strikers Jackie Mooney, Eddie Bailharn and Tommy Hamilton. Hibs in those days were, like their neighbours Cork Celtic, a Cinderella team who suffered two FAI Cup ﬁnal defeats at the hands of the classy youthful Shelbourne in 1960 and ’63. In the 1960 showpiece Blondie was opposed by future Manchester United full back Tony Dunne who, although considered a Speedster, had his hands full trying to contain the equally fast Corkman. In 1963 Hibs had an equalising goal disallowed by the English referee Arthur Holland as their trainer Georgie O’Sullivan had not fully exited the ﬁeld of play after being on to treat an injured player. Those were the sad days but in a memorable career he had the distinction of being capped four times at amateur level against Great Britain, England, Switzerland and Italy. After seven years, the last one interrupted frequently by injury, Blondie announced his retirement on New Year’s Eve 1967 following Hibs League clash with Shels. Major honours may have eluded him in the League of Ireland but when soccer fans reminisce, Blondie’s name trips off many tongues and he is a worthy addition to the list of Cork Soccer Legends. 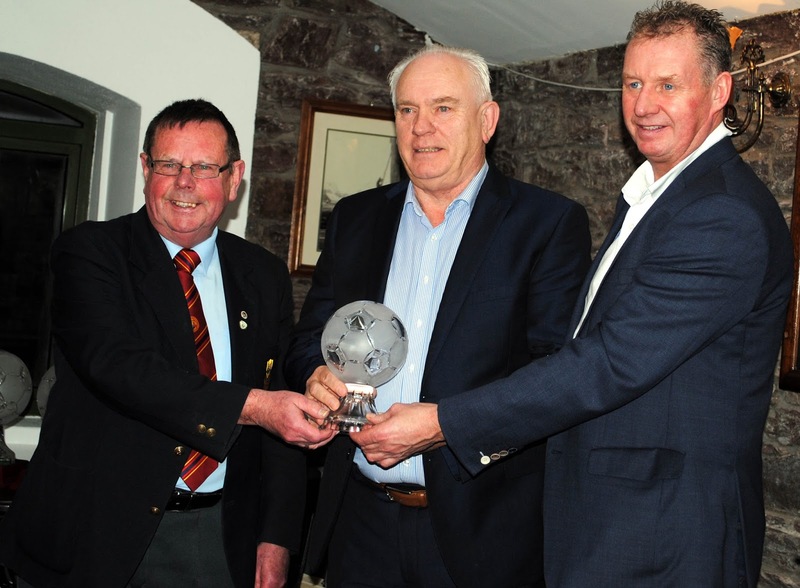 Martin Conlon (Cork AUL) presents the Hall of Fame award to Liam Ronayne at the Cork Soccer Honours Awards held in The Kiln on Friday night.Also in picture is Jim Cashman (Murphy’s Irish Stout). This year’s Hall of Fame recipient Liam Ronayne made most of the lists and was included along with never to be forgotten players like Carl Humphreys, Willie Henchion, Billy Treacy, Tony O’Brien, John Herrick, Bootsie Lynch and Barry McGann to mention but a few. When just 18 he signed for Cork Celtic in August 1968 and in his ﬁrst season, belying his youth, he produced a “Man of the Match’ performance on the team which drew with mighty Shamrock Rovers in the drawn FAI Cup ﬁnal. “Ronayne’s composure, conﬁdence and control had to be seen to be believed. His performance was all the more remarkable due to the fact that he had only come into the side two months earlier”, reported the Cork Examiner. Celtic were within eight minutes of a sensational victory when full back John Keogh (a former Shams player) scored an OG. Lucky Rovers won the replay to retain the trophy for the eighth successive season. It was onwards and upwards for Liam after that and he was a member of the squad that won the League Championship, under Paul O’Donovan, for the ﬁrst time in 1974. Throughout his career Liam suffered with cartilage problems and transferred to the less demanding senior league to assist Everton. In emergency situations he returned to struggling Cork Celtic. After Everton he performed a dual role of senior player and schoolboy coach with Glasheen. As a veteran he became player manager of Villa United and helped them create a major shock when winning the AOH cup in 1991. He was assisted with Villa by Brian Mooney and the duo (Clough and Taylor of Cork Soccer) worked the magic again in 1994 when taking charge of the Everton team which won the MSL for the only time in their history. From his earliest days to the veteran years Liam was a standout player and is a worthy addition to Cork Soccer’s Hall of Fame. 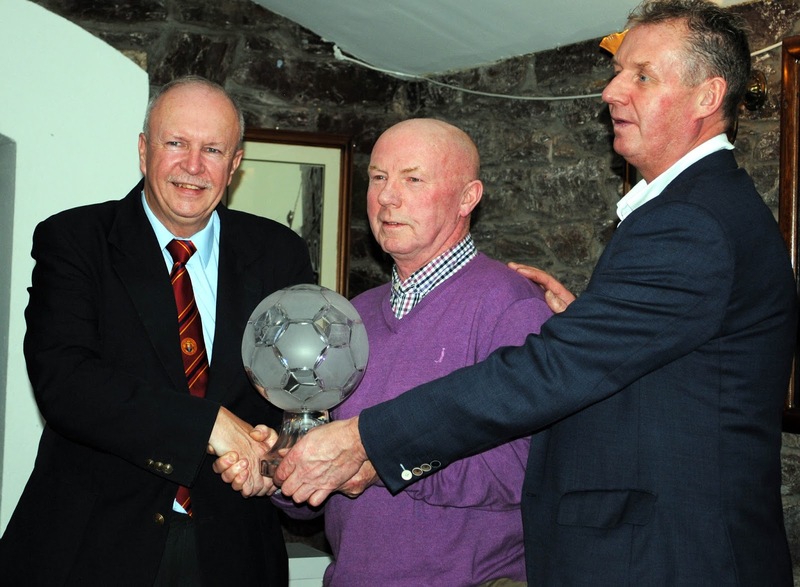 Denis O’Driscoll (Cork AUL) presents a Distinguished award to Brian Lennox at the Cork Soccer Honours Awards held in the The Kiln on Friday night. Also in the picture is Jim Cashman (Murphy’s Irish Stout). When Brian took over City the cost of running the club was estimated at around €1.5 million and within a few years had risen to €2 and €2.5 million. During his first four years in charge he invested hugely in the club but didn’t have unlimited ﬁnancial resources and having failed to persuade local business interests to invest the club came into possession of London based Arkaka. Brian never lost interest in football and is still a patron of the club and widely recognised as the ‘patron saint” of all clubs. He was Avondale’s sponsor in the years that the Ballintemple club dominated Irish Senior soccer. He is well aware of the ﬁnancial constraints associated with the running of junior soccer clubs and has helped many throughout the years. Brian has come a long way since his ﬂying winger days with Lough Celtic in the AUL in 1993 and has perpetuated the Lennox name. It is to his eternal credit that he is revered in Cork soccer as much as his father was in the halcyon years of the Beautiful Game. 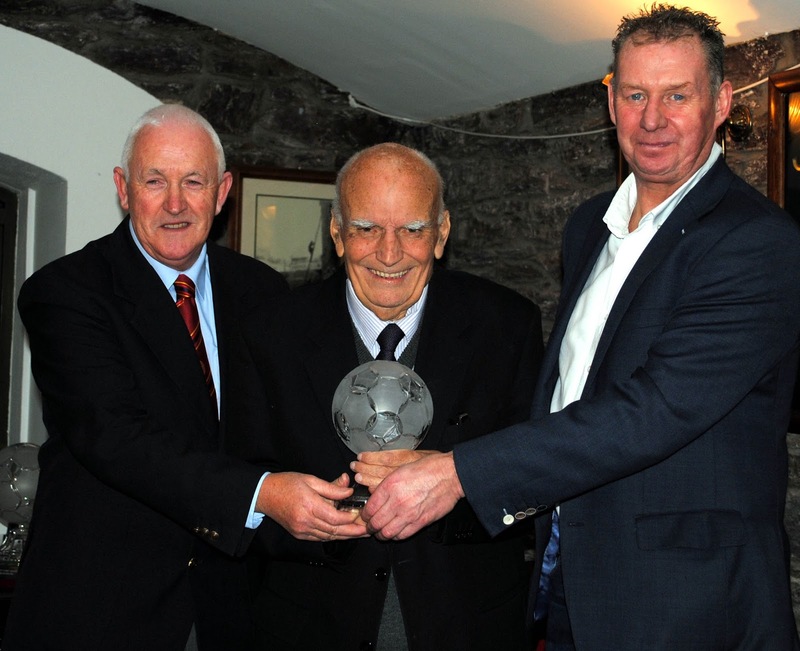 He is unquestionably deserving of this award for his vast contribution to Cork soccer. 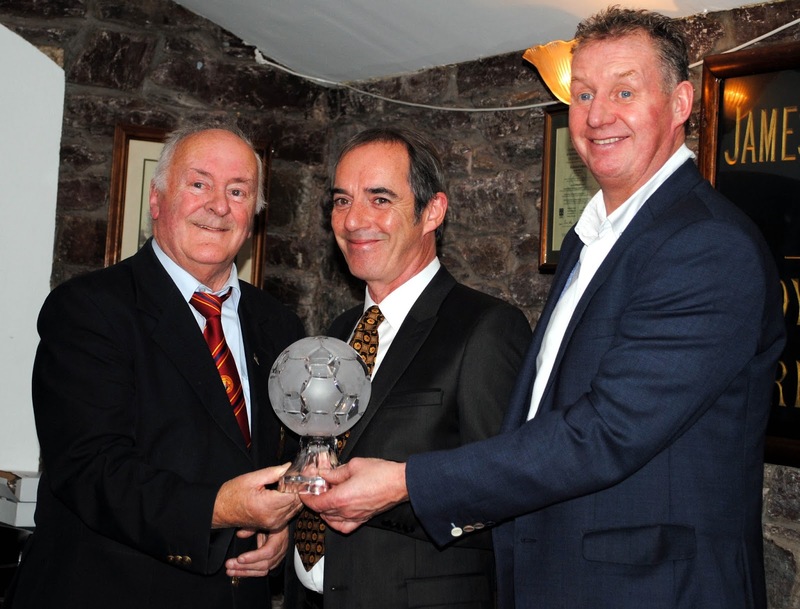 Henry Healy (Cork AUL ) presents a distinguished award to Dave Dorgan at the Cork Soccer Honours Awards held at The Kiln on Friday night.Also in picture is Jim Cashman (Murphy’s Irish Stout). By way of introducing our recipient for distinguished service to Cork soccer I’ll tell you a little corny story. Schoolboys League, a role he performed with diligence and enthusiasm for twenty years. Dave by then was ofﬁciating in the AUL, Schoolboys, Cork Shipping and Inter House Leagues. His happiest days were spent in the Schoolboys’ League and he reverted to them any time an opportunity arose. His biggest thrill was being selected to referee the 1978 Evans National Cup ﬁnal when Tramore were defeated at Flower Lodge by Home Farm. If Dave had a fault it had to be that he was too much of a gentleman and rarely contributed to the ﬁnances of the various leagues with the issuing of red and yellow cards. A golden jubilee is a craved milestone in any walk of life but to achieve it as a ref is deserving of special recognition and surely entitles Dave to a very belated induction on to the list of those honoured for distinguished service to Cork soccer. 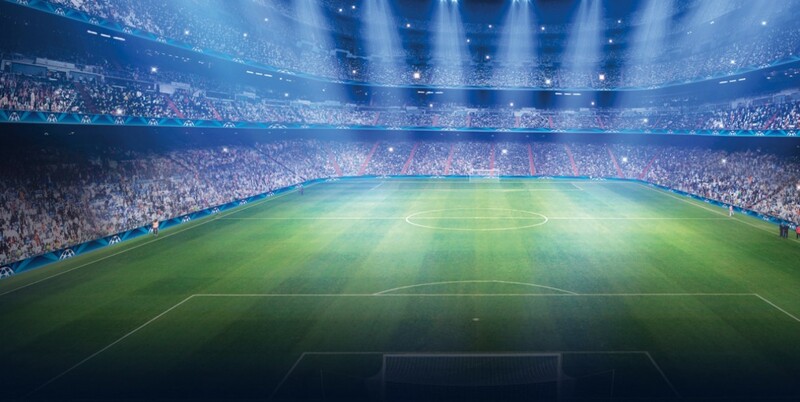 Football referees will continue to rock on an emotional see-saw, one day ready to pack it all in and then feeling a surge of adrenalin before the next match. It is an obsession which yields more satisfaction than frustration. Age sometimes catches up on referees and when Eddie lost his burst of speed it precipitated his retirement from active participation. 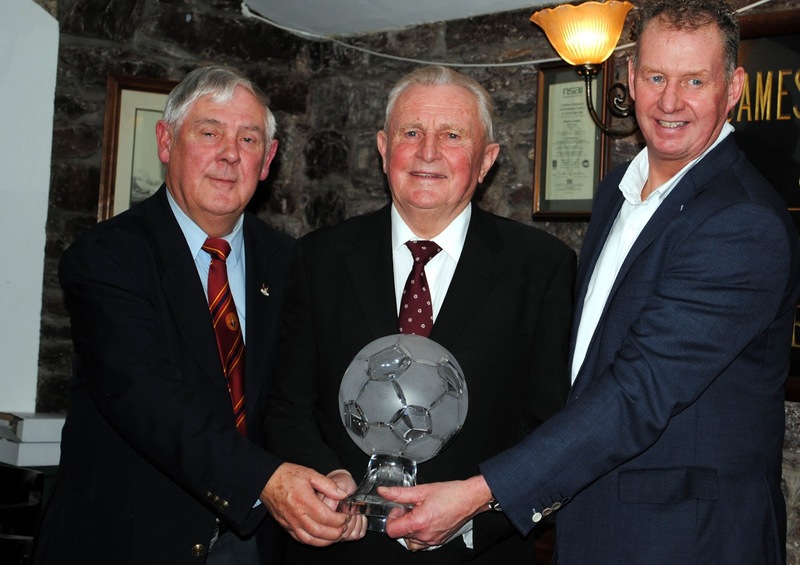 Denis Lyne (Cork AUL) presents a distinguished service award to Eddie Goggin at the Cork Soccer Honours Awards held at The Kiln on Friday night. Also in picture is Jim Cashman (Murphy’s Irish Stout). When Cork Athletics membership of the League of Ireland was cancelled due to their poor ﬁnancial position in 1957, Cork Hibs were elected in their place. All the former Cork Athletic stars had by the time of Hibs late entry signed for other clubs resulting in the newcomers having to recruit players from the local leagues. The cream of local talent answered the call to arms and eight untried players made their debuts against Waterford at Kilcohan Park. Among them was Rockmount youth player Eddie Goggin who signed along with team-mate Jerry Lane. Rockmount won their ﬁrst ever underage trophy when they defeated the supposedly invincible Glasheen in the Murphy Minor Cup ﬁnal in 1955. The following year Eddie, a classic wing half, played a starring role as the trophy was retained. Twelve months later Rockmount were the talk of Cork and swept the board in youth’s football which included a hat trick of Murphy Cup triumphs. Using several of their youth stars including the masterly midﬁelder Eddie Goggin, Rockmount made a bid for the coveted FAI Junior Cup. In the semi—ﬁnal, played in a quagmire at Turner’s Cross, they were held by Dublin’s Virginians who won the replay in the capital. Eddie’s sterling display was brought to the attention of the International selectors who selected him to represent the country on a couple of occasions. His move into League of Ireland football wasn’t unexpected and he enjoyed several seasons with Hibernians. Eddie’s favourite team has to be Bohs as he was on the score sheet in all three Victories recorded against them. After League of Ireland football Eddie returned to Rockmount and he ﬁnished out his career in the colours of Hillington and with them deﬁed age by performing into his forties. However, he didn’t hang up his boots as he answered every call to line out regularly in veteran’s charity matches and we are all delighted that he has answered our belated invitation to accept this deserved recognition for his distinguished service to Cork soccer. Tom Fitzgerald (Cork AUL) presents a distinguished service award to Jerry Myers at the Cork Soccer Honours Awards held in The Kiln on Friday night. Also in picture is Jim Cashman (Murphy’s Irish Stout). In 1970 the Cork AUL youths representative team failed at the ﬁnal hurdle in the prestigious National I Inter League Cup, Eight members of that star studded team graduated to League of Ireland football including our distinguished award winner Jerry Myers who was then with Castleview after joining from Western Rovers. Gerry remained with the View for twelve more months playing youths and junior soccer where he experienced the deadly rivalries existing in the new AUL Premier division of that time. This adult initiation in junior’s top grade helped him make the transition to League of Ireland soccer and he made a Winning debut with Cork Celtic in a local derby against Hibs on 11 August 1971. In a career spanning seven seasons with Celtic he experienced the ﬁckleness of the Cork support when playing at the Lodge and the Cross in front of attendances varying between 20,000 and a mere two hundred. A career highlight was his inspiring midﬁeld performance when Celtic down-faced the mighty Hibs in front of 18,000 ecstatic fans in 1974. It was Celtic’s ﬁrst victory over Hibs in six years and provided the platform for them to go forward and clinch the League Championship. It was also the last time the Top Four Trophy was competed for and ﬁttingly Celtic, the most successful in the history of the competition, took possession of the magniﬁcent cup. When Celtic were on the verge of extinction Jerry diverted to the senior league to play with Everton which was almost surreal having in the previous few seasons played alongside World superstars George Best, Sir Geoff Hurst and Uwe Sealer at the Cross. Jerry had a spell as Manager with Castleview seniors before crossing the river Lee again to re-join Everton. He knew he was at the lowest grass roots level in 1982 when as player manager of Everton juniors he conducted his training sessions under street lighting in Rutland Street car park; similar circumstances, I suppose, to that which contributed to the infamous Saipan debacle. Anyway, Everton won the AUL League and Coach Jerry passed his ﬁrst examination. Later he stepped up to senior ranks and managed the Everton team along with Carl Humphreys which was defeated in the 1992 Munster Senior Cup ﬁnal by Cork City. His is a love of all sports particularly soccer and is a familiar ﬁgure on the Derrynane enclosure for all Cork City matches.